ABSTRACT. This is the first ever online publication of a seminal text authored by two students and collaboraborators of both L.S. Vygotsky and A.N. Leontiev: A.V. Zaporozhets and D.B. El'konin (the two standing gentlemen on the picture of late 1940s). 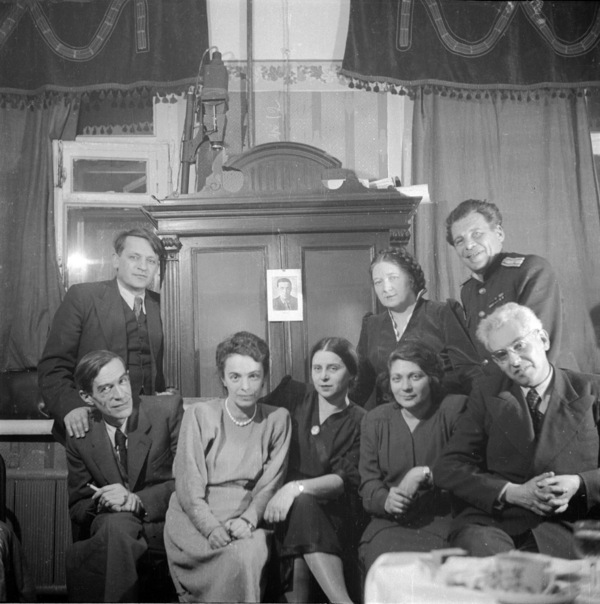 Perhaps the first account of the activities of the gang of Vygotsky's associates after his death in 1934 published, in turn, after and on the occasion of the death of Leontiev. The group is sometimes referred to as the "Kharkov school of psychology". The impact of this account of post-Vygotskian studies was enormous: first, the authors who were the witnesses to and participants of these events, for the first time systematically described the stream of interwar research that lead to the development of the so-called "activity theory" and, second, this narrative was apparently later used by a swarm of authors who generated a number of subsequent equally one-sided and biased stories (e.g., the notorious famous "the trojka da pyaterka" plot). In brief, this is a very important source on the history of Russian "cultural-historical" and "activity" traditions. Some even believe there was just one "cultural-historical activity theory" (aka CHAT), whatever that means. Исключительно важный источник по истории КИТ (aka культурно-историческая теория) и так называемой теории деятельности. Статья вышла в 1979 после смерти А.Н. Леонтьева, и послужила основанием многих перепевов и заблуждений. Пожалуй, первая основательная попытка изложения истории того, что в наши дни известно под именем Харьковской школы психологии.